Half-Life has been in the upper echelons of gaming ever since its release, with Half-Life 2 only improving upon the amazing title. I had known about Half-Life long before getting the chance to play it. When I finally got that chance I wanted to see if it really lived up to the all the hype, and oh my god does it ever. Half-Life 2 is nothing short of the pinnacle of intelligent level and game design. Every second of playtime is emphatically engaging, and every scene is perfectly scripted. The way they hide the correct path in believably random environments, but still manage to somehow guide the player down the right path without them seeing the boundaries of the world or actually knowing if they are going the right way is astonishing. It feels incredibly natural, which translates into an almost unbroken immersion throughout. Add in the great physics puzzles and the super solid game play, and you’ve got one of the most enjoyable and impressive games ever made. Where Shadow of the Colossus amazes because of the emotions it evokes, Half-Life 2 amazes because it is just that good of a game. It’s hard to explain exactly what that means, but it’s seriously one of, if not, the most well crafted gaming experiences I’ve ever played. It’s a level of quality that only Valve is known for producing and it lasts from start to finish. Hell, the gaming engine, the Source engine, is so robust and well made that it’s still one of the most popular and widely used gaming engines today, with Gary’s Mod being in Steam’s top 15 best selling games of all time, and Half-Life 2 being in its top 5. 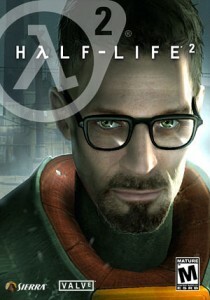 That’s why Half-Life 2 is one of my most favorite games of all time. If you want an FPS that will blow you away, then play Half-Life.